This is Wally Berg calling at about 9:45am and I'm calling you from the very top of Kala Patar at 18,500ft/5,640m. We made it to the top! I'm here with LaQuishia, Paul, Adam, Theresa, Matt, Stephanie, and Mike. LaShonda, Geoff and Kenny all went directly to base camp today but the rest of us wanted the experience of standing on top of Kala Patar. I asked LaQuishia how it feels for her to be up here and she just said "My legs are burning!" But I can tell she is really enjoying the experience and the challenge. Well, we just wanted to call and tell you that we made it to the highest point on our trek in the Khumbu, the top of Kala Patar. We're going on to base camp now to join up with Jamie Clarke and Scott Simper and the Sherpa team for lunch. 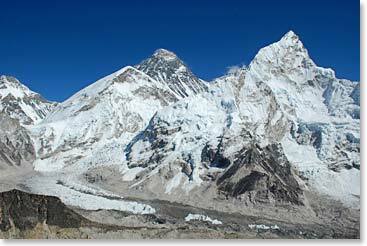 The classic view of Mount Everest and the Khumbu Icefall from Kala Patar. 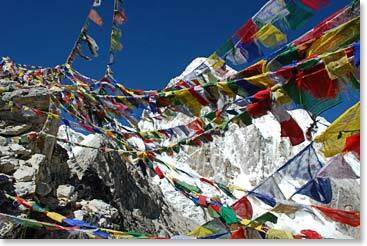 Prayer flags wave in the wind on the summit of Kala Patar.